In the past few years, the revenue recognition rules changed dramatically with introduction of the new standard IFRS 15. All affected companies face a lot of challenges and work related to the proper implementation of the new standard. In today’s article, I’d like to point out the main rules and principles of IFRS 15. What is the objective of IFRS 15? of revenue and cash flows from a contract with a customer. Let me stress “a customer” here. If you have a contract with party other than a customer, then IFRS 15 does not apply. Sometimes, it’s quite difficult to determine whether you deal with a customer or simply with a collaborating party (e.g. some mutual development projects with other entities), therefore take care! Non-monetary exchanges between entities within the same business to facilitate sales. We need to apply IFRS 15 for periods starting from 1 January 2018 or later. The main aim of IFRS 15 is to recognize revenue in a way that shows the transfer of goods/services promised to customers in an amount reflecting the expected consideration in return for those goods or services. It seems understandable and very easy at first sight, and it truly is in many cases. So why is IFRS 15 so extensive? Get bonuses for delivery on time; etc. To make it systematic, IFRS 15 requires application of 5 step model for revenue recognition. Let’s describe them a bit. A contract is an agreement between 2 parties that creates enforceable rights and obligations (IFRS 15, Appendix A). It is probable that an entity will collect the consideration – here, you need to evaluate the customer’s ability and intention to pay. So, if the contract does not meet all 5 criteria, then you don’t apply IFRS 15, but some other standard. Therefore, be careful about intragroup transactions, as they often lack a commercial substance (as these companies often transfer inventories and other items at prices different than the market). 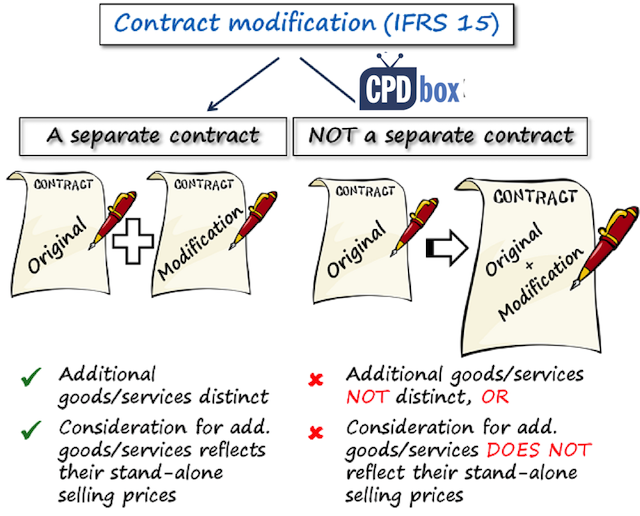 IFRS 15 provides a guidance about contract combinations and contract modifications, too. Contract combination happens when you need to account for two or more contract as for 1 contract and not separately. IFRS 15 sets the criteria for combined accounting. Contract modification is the change in the contract’s scope, price or both. In other words, when you add certain goods or services, or you provide some additional discount, you are effectively dealing with the contract modification. IFRS 15 sets different accounting methods for individual contract modification, depending on certain conditions. Performance obligation is any good or service that contract promises to transfer to the customer. A series of distinct goods or services that are substantially the same and have the same pattern of transfer. An essential characteristic of a performance obligation is the word “distinct”. Simply said, distinct means separable, or separately identifiable, and IFRS 15 sets criteria that you must assess in order to determine whether the performance obligation is distinct or not. Let me say that this is extremely important and you must do it right. The reason is that in further steps, you will account for distinct performance obligations and their revenues separately, in line with their allocated transaction price, and if you fail in the correct identification of distinct performance obligations, then the whole contract accounting will be wrong. I say more about that in my IFRS Kit, so check it out if you need. Let me also add that the performance obligations can be both explicit (e.g. written in the contract) and implicit (e.g. implied by some customary practices). Also, if there’s no transfer to customer, then there’s no performance obligation. For example, imagine you construct a building for your client. Before you actually start, you build a small mobile toilet for your workers. As this will not be delivered to your customer, it is not a separate performance obligation. The transaction price is the amount of consideration than an entity expects to be entitled in exchange for transferring promised goods or services to a customer, excluding amounts collected on behalf of third parties (IFRS 15 Appendix A). That’t the definition from the standard and in other words, it’s what you expect to receive from your customer in return for your supplies. Attention – it’s NOT always the price set in the contract. It is you expectation of what your receive. It means that you need to estimate the transaction price. First, you need to take the price stated in the contract as some basis (if applicable). Variable consideration – are there some bonuses or discounts, for example, performance bonus? Significant financing component – if your clients will pay you with delay, do the payments reflect the time value of money? Non-cash consideration – do you receive some non-cash items from your customer in return for your goods or services? Consideration payable to a customer – do you provide some vouchers or coupons to your customers? Once you have identified the contract‘s performace obligations and determined the transaction price, you need to split the transaction price and allocate it to the individual performance obligations. When allocating considerations with variable amounts. A stand-alone selling price is a price at which an entity would sell a promised good or a service separately to the customer (not in the bundle). The best way to determine a stand-alone selling price is simply to take observable selling prices and if these are not available, then you need to estimate them. IFRS 15 suggest a few methods for estimating stand-alone selling prices, such as adjusted market assessment approach, etc. If this seems to theoretical, let me point you to this article. It illustrates all steps on a very simple telecom example. A performance obligation is satisfied (and revenue is recognized) when a promised good or service is transferred to a customer. This happens when control is passed. At the point of time – in this case, control is retained by the supplier until it is transferred at some moment. IFRS 15 sets a few criteria when you should recognize revenue over time. In all other cases, revenue is recognized at the point of time. You can read more about it in this article, or learn it in details in my IFRS Kit. Those are the incremental costs to obtain a contract. In other words, these costs would not have been incurred without an effort to obtain a contract – for example, legal fees, sales commissions and similar.These costs are not expensed in profit or loss, but instead, they are recognized as an asset if they are expected to be recovered (the exception is the contract costs related to the contracts for less then 12 months). Costs to fulfill a contractIf these costs are within the scope of IAS 2, IAS 16, IAS 38, then you should treat them in line with the appropriate standard.If not, then you should capitalize them only if certain criteria are met. As I’ve written above, you have to apply IFRS 15 mandatorily for all periods starting on 1 January 2018 or later (earlier adoption is permitted). Be careful, because you should present comparative figures, too – so in practice, you need to present the results for the periods starting on 1 January 2017, too. Under this approach, you need to apply IFRS 15 fully to all prior reporting periods, with some exceptions. Under this approach, comparative figures remain as they were reported under the previous standards and you recognize the cumulative effect of IFRS 15 adoption as a one-off adjustment to the opening equity at the initial application date. IFRS 15 also prescribes some presentation rules, necessary disclosures and provides further guidance in the specific circumstances in the implementation guidance. This is a great material you provided. Thanks for this. It makes easy understanding revenue . Clear explanations to IFRS 15, I really appreciate Silvia. Thanx. Hi, the video stops after 4 and a half minute, but is about 17 minutes. Good artikle about IFRS 15.
it’s hosted by YouTube, so unfortunately, I can’t really do anything about stopping after 4 minutes. Maybe reloading the browser would help. Thank you! Whats the strategy can one adopt to be a star at IAS and IFRS. Thanks for making my life easier Silvia .Very beautifully explained ! Keep rocking and wish you all the very best. great explanation , easy to understand & remember the ifrs terminology …. great work mam keep it up . You are the best Silvia mam….I hade money I would have pay u all the u want for your course.but,unfortunately I’m working in small audit firm they pay me only TK 5000 which is equal to $50 only/month….so cannot afford to buy full course……. My question is what we have to do about intra group transactions as you also mentioned above that it lacks commercial substance. I would really appreciate if you will reply to my query. thanks a million Silvia for this article. I think it will help me a lot with my ACCA P2 Corporate Reporting exam. Like you have written article on IFRS 15 vs. IAS 18: Huge change is here!, may i know if there is similar article on IFRS 15 vs. IAS 11(Construction Contracts ). Hi Silvia, I have been following your articles and they are really interesting to read. This new IRFS5 has big impact to my company and I have a question which I hope you will be able to give me some advice. We sell engines in bundle which includes commissioning, warranty, training and spare parts at one price. In terms of identifying performance obligation (PO), I see that selling of engine, commissioning and warranty as one PO, training of customer as one PO, and finally spare parts as another separate PO. What do you think? yes, it can be like you wrote. But also, it can be the other way round. IFRS 15 has the exact rules to assess whether there is a separate PO or not. First of all, a service or a good must be DISTINCT, i.e. 2) the good or service is distinct within the context of the contract (the promise to deliver is separately identifiable). It’s up to you to assess your specific situation. See, the same thing can be different in different entities based on the specific terms of their contracts with customers. I recommend reading further guidance in paragraphs 27-30 of IFRS 15. Hope it helps! S.
Thank you for your great work on revenue recognition. I have a question concerning revenue recognition, on which I hope you can help to clarify. AS an example, there is a company engaged in the provision of transportation services and certain transportation costs (i.e. parking fees) are subject to reimbursement by the customers. The transportation costs to be reimbursed by the customers are billed together with the agreed transportation service fees. And the supporting receipts of the transportation costs will be sent back to and retained by the customers before the costs being reimbursed. In such a case, could the transportation costs be deducted from the service fee in presenting the revenue for recognition under IFRS? I have some questions here. First, If there is sales-based royalty as an exchange of a contract, then how should I treat that case? Should I capitalize it as a cost of obtain a contract? Second, if the entity sign a contract that grant a franchise license that provide customer of a right to use it’s trade name and sell the entity’s product, is it a collaboration or customer-based relationship? I’m glad if you respond to my question. 1) It depends on what it is. If it’s a “royalty” paid to acquire contract, then yes, it’s a cost to obtain a contract. I don’t get it clearly from your wording. 2) It’s a customer-based relationship. S.
Could you please tell me what is the other standards we can use if the 5 criteria didn’t meet? what are these “other” Standards? Hi Hashem, this depends on the specific transaction, but for example, IFRS 9 Financial instruments, IAS 16, etc. S.
Another question please, the dividends revenue and other revenues that aren’t mentioned in IFRS 15,where I can find them? in which standards? when IFRS 15 was issued, it automatically amended IFRS 9 and the new paragraph 5.4.1 A was added – it clarifies the dividend income. S.
Thank you so much, appreciate your assistance. If we recorded the free handset as marketing expense in prior years under IAS 18, does it mean we also need to reclass such recording from selling expense to cost of service/goods sold in the P/L when we are about to do full retrospective application of IFRS 15? Since we are also recording part of the revenue on the free handset provided. yes, I’m sorry, you have to do it for the contracts that are still open (existing at the transition date – contracts that were completed before the transition date are OK and no restatement needed).Also, you don’t have to restate the contracts completed within the same annual period. S.
Please, help me with accounting treatment under contracts with my customers. I have seen your video about variable consideration and I think that this contract has variable consideration, because the amount of payment depends on exchange rate, but this is not foreign exchange contract. Company sold fertilizers to farmers . The currency of company and farmers is hryvni – the same. The price of goods were 1000 dollar under the contract, but buyers will pay hryvni within 1 year – on 2017 March, 3 according to exchange rate on the date of payment. Fertilizers were delivered to farmers in September 2016 when exchange rate was 25 UAH/USD. The company made entry: Dt Contract asset Cr Revenue 25000 UAH, because payment due on March 3 2017. Is it ok? Or company must apply Dt Receivables Cr Revenue? In fact customer paid 28300 UAH on March. Can company apply IFRS 9 for contract assets and asses the contract assets at the fair value ? In such case company will show differences in Profit or Loss statement 28300-25000 = 3300 UAH. Or company must change recognized revenue like additional bonus? Can company classify Receivables as financial assets subsequently measured at fair value? Hope your professional advice. Thank you. Dear Olena, I am sorry, I am so busy these days that I have delays in responding these complex queries. But I’ll try. What does the contract say – is it to sell in USD? Or in UAH with the adjustments for the movements in foreign exchange? In my opinion, this is not the case for the variable consideration and you should not account for the contract asset, but for receivable at the time of meeting the performance obligation (delivery). I guess you invoiced on that day, too. For me it seems that if you sell in USD to Ukrainian farmers, or in UAH but adjust for forex movement, you have an embedded derivative there and you should look to chapter 18 or 19 of the financial instruments videos in the IFRS Kit. Of course, I don’t have much information and I assume certain things here – it could be different way, based on the contract. S.
but after watching chapter 18 I’d like to precise. Contract say, that we sell in UAH with the adjustments for the movements in foreign exchange. Host contract is the contract for sale of non financial assets. and not separate embedded derivative from host contract. Therefore, I recognize receivable on the date of delivery and will measure receivable at fair value (adjusted for exchange rate) on the reporting date. The changes in fair value I will report in profit or Loss statement. Is it correct? I very appreciate your attention. Many thanks. in fact, as the final price is pegged to USD, it’s an embedded derivative because USD is a functional currency of neither seller nor buyer. The question is whether similar trades in Ukraine are normally performed in USD or not – if yes, you don’t need to separate. Also, you don’t have a non-financial asset here – instead, you have an embedded derivative in a financial asset = receivable. Under IFRS 9, in this case, you don’t need to separate, under IAS 39, you do separate if the 3 conditions are not met (one of them is selling in a currency different than the functional currency and that could be your case). if you do not need to separate => treat the whole receivable + forward as a hybrid contract, i.e. revalue the receivable to its fair value. I have watched your video and thank you for providing us such a great and clear explanation! maybe there is a small correction needed for revenue over time (when control is transferred) and revenue at the point of time (based on progress). There should be revenue over time is based on progress whereas revenue at the point of time is when the control is transferred, is that correct? Hope to hear from you! Thank you, Silvia. thanks for your comment but I think the video is correct. You ALWAYS recognize revenue when control is transferred. Control can be transferred over time or at the point of time. S.
Very very useful explanation without having background all concepts got cleared. Hi Silvia … Thanks for this short video. What is the implications of penalties and notice periods. If notice period is 30 days only without significant penalties for cancelling the contract, how does that affect revenue recognition for example in a master service agreement where you provide planned maintenance and adhoc service to customers? As the contract term is just 30 days, should we just recognise revenue as we invoice monthly? Hi, Silvia. Thank You very much for your clear explanation. It would be very helpful to count with some insides regarding disclosures required by IFRS 15. How Energy company supplying Gas and Electricity to domestic customers will recognise revenue? Based on the definition above, I am assuming there is no change from 01/01/2018. However, it would be great if you can enlighten this. Hi Sunny, I really can’t say how – it depends on the specific transactions, bundle offers and many different things. I would say that the basic electricity transactions will be accounted for just in the same way as before. S.
IFRS 15 will replace IAS 11 – Construction contract for period on and after 01/01/2018. It means that with a construction contract, percentage of completion method is no longer can be used. We must recogonize revenue based on actual completion of performance obligation instead (at the point of handover and accepted by client). No, Trang, that’s not correct. In fact, you will account for the construction contracts similarly as under IAS 11 – as soon as you assess that the control is transferred over time (not at the point of time). S.
My holding company rent several assets on longterm basis to its subsidiary on 1 Jan 2017. Those assets already operated until now by the subsidiary. But the problem is, until now November 2017, the rent contract still not signed by both party due to administration reason. However, holding company already recognized the rent revenue, and the subsidiary recognized rent expense. The argument is base on substance over form principles, since the asset already operated by subsidiary and the contract is just a matter of time. As you mentioned, “Step 1: Identify the contract with the customer: A contract is an agreement between 2 parties that creates enforceable rights and obligations (IFRS 15, Appendix A). For the case above, do you think it is appropriate for the holding to recognize the rent revenue? Here, I am NOT going to answer your question. Instead, I have more serious matter: You copied some of my articles and posted them to your own website, auditcorner.com. Yes, you stated the author, but I did not give you my permission to do so. Please, take these articles down from your website with immediate effect (prepayments in foreign currency and cash flow statements). Believe me, I have serious reasons for this. Thank you. S.
Iam sorry for my mistake, I already remove your articles from my web. Please check. And please notify me if there is another mistake I made in my blog. Hi Yulias, thank you, much appreciated! S.
For the “Full Retrospective Approach” does this apply to your Revenue line item on your Income Statement ONLY? Or does it apply to your Retained Income on both your Balance Sheet and Changes in Equity Statement? For the “Modified” Approach are you saying that currently ( Assume 31/12/2017 Year End) an entity can disclose Revenue inline with IAS 18 however from 2018 onwards the only effect will be shown through Retained Income? I’d enjoy your knowledge always and having a great time to read, as it’s clear and direct to the point of the information you’re delivering. Just a quick question to check from you regarding the IFRS15 and your previous “telcom 12 month plan and free headset” example. 1. Was wondering is that appropriate to recognize the 12 month contract in the early stage? which gives a “debit in unbill revenue CU1200” and “credit revenue headset CU285.60 + credit revenue telcom service of CU914.40”. 2. How do the “control” connect to the telco scenario? 3. Telcom example again (great example 😉 ), if the plan customer sign off is a contractual plan where there’ll be full payment penalty upon termination prior to the expired date, will the double entries being the same? 1) I think that’s not what I wrote. You do NOT recognize the full revenue at the inception. You just recognize Debit Unbilled revenue 285.60 Credit Revenue handset 285.60. The revenues from network services are recognized as they are provided (over time) – i.e. 914.40/12 = 76.20 each month. 2) You recognize revenue from the sale of handset when telco passes control to the client (at the point of time) and revenue from network service as the client takes benefits (control) of it – over time. 3) In general yes, but telco must assess all aspects of the contract in relation to penalty. For example, whether the termination penalty is substantive or not, and if it is not substantive, maybe it should be included in the transaction price (if the statistics show that majority of clients terminate early…). You get the point. Who’s the guy in the picture? He’s cute. Hi Silvia, Thanks for helpful explanations. I have a question about identifying the performance obligations. If the company sells multiple identical products and does not meet the criterion of recognizing revenue over time, these products are one performance obligation or multiple performance obligations. For example, the company manufactures and sells 100 bottle of cokes at 2 dollar per bottle and 40 bottles of spirits at 1.5 per bottle in the contract. How many performance obligations in the contract? I feel like each bottle of drinks has met the definition of distinct, but I am not sure. Thank you so much. Hi Wendy, technically speaking you are right (or better said, speak about unseparable bottles within one package, some companies sell only by 6 pieces in 1 pack and in this case, the pack is a separate PO), but if all bottles are to be delivered at the same time, then you can group them and recognize the revenue at the point of time in total. S.
Hi Silvia, thank you so much. That’s really helpful. I am currently studying the revenue recognition. Can I ask another question about the adoption method (full retrospective adoption and modified retrospective adoption)? If IFRS 15 has no impact on the company for the prior reporting periods, Does the company still need to choose one of the adoption method? Does it account for the changes of accounting policy? HI, Suppose accounting period in ending June, 2018. So, Should i apply IFRS 15 in this period? if it’s a year ending 30 June 2018, then no, you do not have to follow IFRS 15. In the beginning of the summary there stands exclusions Leases IAS 17 does it not have to be IFRS 16 now? Yes, sure, both of them – thanks! I need your guidance as I am having some serious hurdle implementing IFRS 15 in real estate sector. Here I will try to give as much detail as possible to make you clear about my problem area. First let me brief you about the situation- I am working in an merchant bank and my prospective client who is in real estates sector will go for public listing in 2019. They have already prepared their account till 2016 under IAS 18 i.e. they recognize revenue when they hand over the land or building in that period. 1. Can I apply IFRS 15 in the accounts ending June 2018? 2. In that case I need to restate the figure of 2017 (as I will be showing comparative figure). Can you please provide me details about how can I restate the 2017 figure according to UFSR 15 (was recorded according to IAS 18 earlier). 3. In listing we need to show last 5 years result. So if I record accounts of 2018 and 2019 (2017 in cooperative) revenue as per IFRS 15 but accounts of 2015 and 2016 as per IAS 18. Will that be problem? What is IFRS guideline on this? 4. In Real Estate Company they usually have large land bank. Some are purchased for selling and some sold after building construction. In that case how these should be recorded as inventory or as investment property? 5. Can we revalue land that are for sell or for the purpose of constructing building and sold afterwards. what will be the accounting treatment for non current assets held for sale (Non banking assets or asset acquired by the bank in case of loan 100% default)? I just noticed that the diagram on “when to recognize revenue?” contains an error. I think under the Revenue over time box should be “based on progress” while the Revenue at the point of time should be “when control is transferred”. I hope this could be rectified even if it is obvious. Sure, thanks, noted and corrected. My apologize for wrong spelling of your name before. Many thanks for your detail explanation of this complicate standard. I have one question about the double entries under IFRS 15. Under IFRS 15, as we have no contractual right, we have to Dr Contract asset but where will be the Cr entry going to? if you determine that the control passes to a customer when the good is actually delivered (this might not always be the case, e.g. look to various incoterms, but let’s keep it simple here), then you account for the revenue from sales at the time of delivery. At the time of order acceptance, you should NOT book any contract asset, because you have not delivered anything to a client yet. You just asked for money. If you have no contractual right to receive money on order, then you should not book anything at all. Please look at this Q&A to see the difference between contract asset and trade receivable. S.
I work in a warehousing company with 1000+ employees (revenue is Usd 500,000+). For purposes of safety and security, a security card system was installed at all doors/exit/entry points. 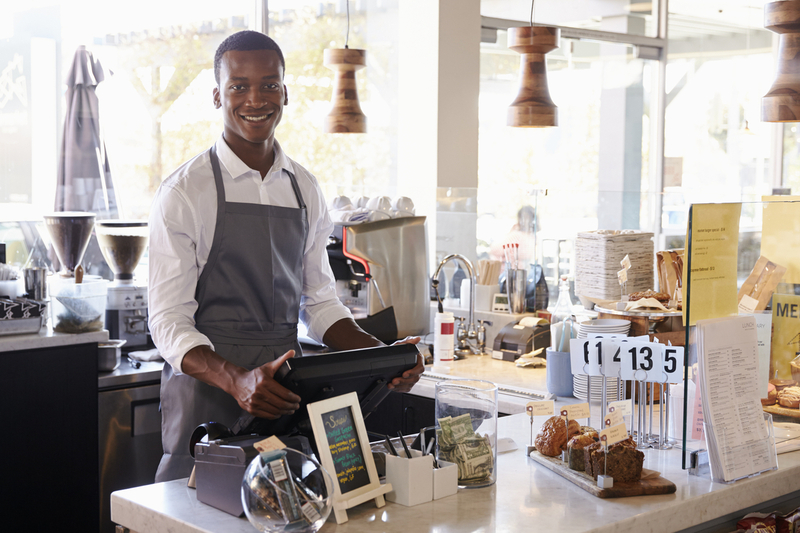 Employees are provided with a security card for free when employed. However, any replacements due to loss or damage are charged on the employee at Usd 10. Total amount collected from employees is about Usd 900. A supplier has been contracted to supply the raw materials e.g laminators etc but the printing is done by the company. This security card costs are expensed in the p&l. My question is should the amount collected (usd 900) be recognized as in income in the P&L or should it offset the security card cost. Reason for offset is because the amount collected is immaterial compared to the revenue and the printing of the replacement card is at cost. Hi Said, this is VERY immaterial… I would simply offset, but technically it would be correct not to. S.
May I know whether donation income of a charitable insitution is fallen into the scope of IFRS 15? If no, can it be grouped under revenue in the income statement of the insitution? I would say NO, because IFRS 15 guides revenues from contracts with customers and you cannot say that donors are customers of the charitable organization. Other than that – yes, it is a sort of revenue in the income statement. S.
Could you please advice with regard to the recognition of non refundable connection fee collecting in advance by a cooling service company.? Company is treating connection fee as revenue upfront instead of deferring over a period of 25 years.for last 6 years as per IAS 18. However recognising capacity and consumption charges over the period of contract upon actual connection of cooling service.The connection fee is coming about only 4% of total expected revenue over the period of 25 years.we prefer to continue the upfront recognition of connection fee collected as revenue? Can we continue this upfront revenue recognition of connection fee as per IFRS 15? So impresed with your easy explanations. Our company is an insurance broker. We recognise commissions as revenue on insurance products we sell. We receive the commissions from Insurance companies. Kindly expecting the proper treatment under IFRS for following special products. 01. Long term insurance policies : We sell more than 1 year ( 2/3/4 years) motor insurance policies to our clients and we receive total commissions ( credit notes) for all the years. Should we recognise the 1 year commission as revenue and the balance years’ commission as Deferred reveue? 02, We sell Extended Warranty (EW)and recognise commission as revenue for the same. But the EW starts after 3 years of manufacturer’s warranty. Pls advise when we should recognise the commission this EW products? Kindly expecting your recommendations .